Why choose a mental health mentor? Craig Fearn from Lighthouse Mentoring explains why we should consider the services of a mental health mentor. We make an abundance of choices every day, many are inconsequential, some are not. We can choose where to buy our coffee; what brand of shoes we want, where we want to live, and if we are lucky which school our children attend. What each of these choices share in common is that the solution will be different for everyone. There really is no one size fits all situation in life these days and I for one am happy about that. Frequently, choice leads to confusion and procrastination, especially when there is so much choice. We can lose sight of what it is we actually want, or which path to take to get us there. Throw into this mix poor mental health issues such as stress, depression and anxiety and we can quickly become overwhelmed. How could a mentor help? 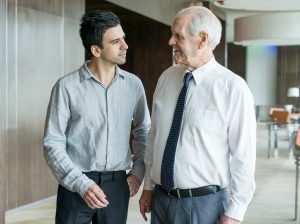 Mentors are trusted and respected advisors with life experience and knowledge that can help support your decision making by asking the right questions. Mentors operate across the spectrum, from business, finance and career planning, helping you to set personal goals and ways to achieve them. In the field of mental health, a mentor is a trusted and respected adviser who can help you improve your mental health through their life experience and knowledge. A mental health mentor may well have experienced the issues you are facing and as such come armed with the solutions and strategies that they have used successfully before. It is an empowering way to engage support and work towards more positive mental health, identifying solutions that are right for you, and you alone.